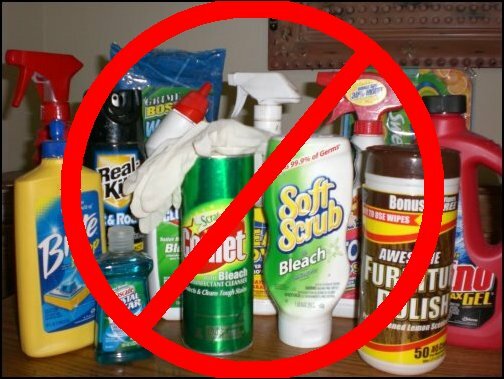 A number of home cleaning products are likely to contain toxic ingredients: bleach, brass or other metal polishes, drain cleaner, carpet cleaner, room deodorizer, dishwashing detergent, fabric softener, laundry detergent, anti-cling sheets, mould and mildew cleaner, mothballs and spot remover all usually contain irritating or toxic substances. However, you will probably not find the ingredients on the labels, and if you do they will be disguised by category names that leave you none the wiser. Para-dichlorobenzene (PDCB); napthalene; formaldehyde; Sodium bisulphate (sulphuric acid); solvents (ethyl/isopropyl alcohol, propylene glycol, ethanol, Butyl cellosolve); synthetic perfumes; detergents /surfactants containing DEA, TEA and morpholine; EDTA; ammonia; phenol (carbolic acid/cresol); coal tar dyes; Pine oil; alkyl phenols (include nonyl phenol, nonyl phenoxy ethoxylate, alkyl phenol polyglycol; petroleum distillates; bleach; napthas; nitrobenzene; phosphates (ecological disaster); polyethylene glycol (PEG); and many others. In South Africa, personal care products, by law, have to list ingredients on labels, some of which are listed below. Cause allergic reactions, irritate the eyes and dry the hair and skin. Can be carcinogenic. PEG can mix with DEA and TEA to form carcinogenic nitrosamines. Stabilises bleach and foaming agents in detergents. Irritates skin and mucous membranes and binds with toxic metals in the environment, carrying them back into our drinking water and the environment, especially fish and shellfish. Also known as mineral oil jelly, liquid vaseline, paraffinum liquidum and baby oil. Can cause photosensitivity and strips natural oils from the skin, causing chapping, dryness and premature ageing. Prevents elimination of toxins and can cause acne and other disorders. These formaldehyde-forming preservatives can cause joint pain, allergies, depression, headaches, chest pain, chronic fatigue, dizziness, insomnia and asthma. Can also weaken the immune system and even cause cancer. Found in skin, body and hair products, anti-perspirants and nail polish. A poisonous solvent and denaturent (alters the structure of other chemicals). Found in hair-colour rinses, body rubs, hand lotions, after shave lotions, fragrances. Can cause nausea, vomiting, headaches, flushing, depression. Also, dries skin and hair and creates cracks and fissures in the skin which encourage bacterial growth. Found in foaming products such as shampoos, hair conditioners, toothpastes and body washes. Strong detergent which can cause eye irritation and permanent damage to the eyes – especially in children, skin rashes, hair loss, flaking skin and mouth ulceration. When combined with other ingredients, can form nitrosamines, which are carcinogenic. Easily penetrates the skin and can lodge itself in the heart, lungs, liver and brain. A petroleum-based ingredient used in hair sprays. Padimate-O, also known as octyl dimethyl, PABA is found mainly in sunscreens. Like DEA, a nitrosamine-forming agent. There is concern that the energy absorbed by this sunscreen is then turned into free radicals, which may actually increase the risk of skin cancer. Methyl, propyl, butyl, and ethyl paraben used to extend shelf life and inhibit microbial growth. Can cause rashes and other allergic reactions. Synthetic colours: coal-tar dyes are generally labelled as FD&C or D&C followed by a number. Carcinogenic. Found in baby powders, face powders and body powders. A major cause of ovarian cancer when used in the genital area. Can also lodge in the lungs, causing respiratory disorders. Usually petroleum based. Can cause headaches, dizziness, rashes, respiratory problems, vomiting, skin irritation and multiple chemical sensitivity. Chemical products in the home also have a negative impact on the environment. When they are used and disposed of, they release chemicals into the ground and wastewater which may contaminate our groundwater and present a problem to wastewater treatment facilities. Most often, hazardous products are not disposed of properly and are landfilled or incinerated where they release their toxins to the environment. Some of these toxins, such as the chemicals in household cleaners, pesticides and insecticides, persist in the environment and can concentrate as they go up the food chain. They have wiped out many species and produce stronger resistant strains of pests and insects. Phosphates, used to soften water and help detergents rinse better, are devastating to the environment, causing algae blooms that choke waterways. The toxic effects of chemicals in your home has serious short and long term repercussions for you, the environment and all its living entities. PVC plastic frequently contains phthalates, which evidence has suggested could be hormone disrupters, so avoid goods and toys made from this material. Buy organic products and produce whenever possible and support local growers. Avoid using pesticides and chemicals in your garden and going near areas that have been freshly sprayed with pesticides. Read your labels and choose a safer alternative. Lobby government to make it mandatory to include ALL ingredients on home cleaning products. Educate yourself so you can make informed decisions. This entry was posted in articles and tagged Common Chemicals.